"It will make you feel very funny" was the tag line for Cheech Marin and Tommy Chong's 1978 hit comedy, "Up in Smoke." The granddaddy of stoner movies, "Up in Smoke" has become part of popular culture and influenced drug-fueled slacker comedies over the last three decades. Now Film Independent at the Los Angeles County Museum of Art is paying tribute to the Lou Adler-directed comedy that Variety described as a "mixture of fitful slapstick and toilet humor," July 25 at the Bing Theater. Marin is scheduled to appear in conversation at the screening. 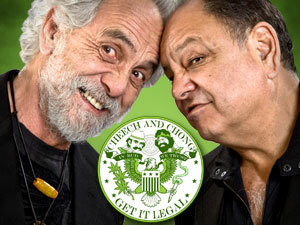 The film finds Cheech and Chong as -- guess what? -- a pair of stoners who set out on the road to find freedom and some righteous pot. Stacy Keach, Tom Skerritt, Strother Martin and even Edie Adams are along for the irreverent ride. Reviews were decidedly mixed, but Pauline Kael wrote in the New Yorker, "This piece of stoned-hippie foolishness, starring the comedy team Cheech and Chong, who wrote the script, is fairly consistently funny." The R-rated film was one of the biggest hits of the year, earning more than $44 million, placing 14th on the Box Office Mojo chart of slacker/stoner films. Last year's "Ted" is No. 1 in the genre, with more than $218 million. "Up in Smoke" was the most successful of the eight films Cheech and Chong made. The trailer for Martin Scorsese's latest film, The Wolf of Wall Street, has been posted. It stars Leonardo Dicaprio. Why is this Cheech and Chong site posting about it?...because the film is based on a book written by Jordon Belfort. He served time at Taft Correctional at the same time Tommy Chong was at Taft. They were cellmates. Jordan saw that Tommy Chong was writing The I Chong: Meditations from the Joint and wanted to do the same.